We have Just Sold out of Gundam The Origin Movie Guncannon Mobility/Firepower Test Type High Grade 1/144th Scale Model Kit. Not to Worry! Fill in the Notify me When Available and you will be the first in line for our restock of Gundam The Origin Movie Guncannon Mobility/Firepower Test Type High Grade 1/144th Scale Model Kit !! From the Gundam collection by Bandai Hobby Gunpla. Gundam The Origin Movie Guncannon Mobility/Firepower Test Type High Grade 1/144th Scale Model Kit. Comes with 9 Runners - marking sticker - instruction manual. Measures approximately 5 inches tall when complete. Ages 15 and up. 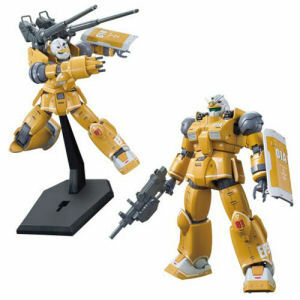 Bandai Hobby Gunpla Gundam Models shipping from Canada. No Surprise Border fees or Customs!